This week, Levi takes center stage, as the title character in the extremely fun DC superhero movie Shazam! Middle-schooler Billy Batson is suddenly given superpowers, and Levi personifies the insecure goofiness of a teenager in an adult superhero’s body, as Billy strives to become a real hero. It’s a perfect and fun role for Levi, who appreciates the tween-aimed bent of the movie. “It’s digestible for their kind of minds and hearts for sure. 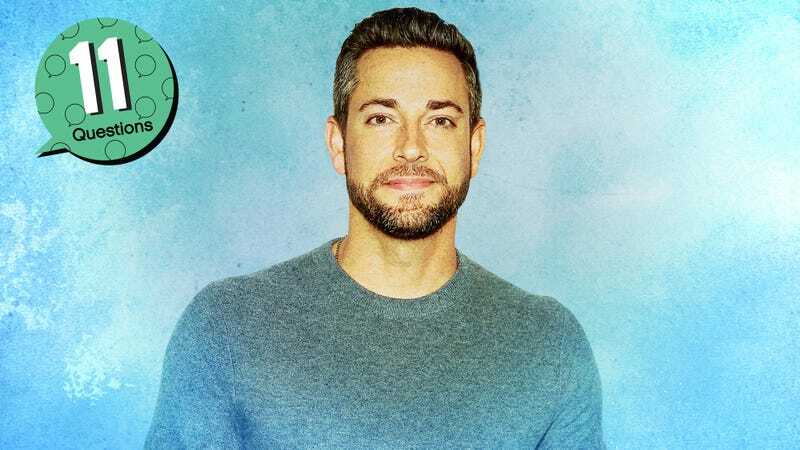 Ideally, we’ve created something for a wide spectrum of people, but certainly something where kids can identify, like, ‘That’s me right there.’” A few weeks before Shazam!’s big opening, Levi visited Chicago and sat down with The A.V. Club to run through our 11 Questions that weren’t actually all about superheroes, but a lot of them wound up there anyway. 1. What’s your favorite fast food menu item? Zachary Levi: Crunchwrap Supreme at Taco Bell. The A.V. Club: Is that a late-night thing? ZL: ’Cause why choose? And they put some really good stuff in that crunch wrap, too. AVC: How many do you usually get? ZL: Depending on how hungry I am, I can usually go through three of them. But I don’t typically do three. I might get, like, two Crunchwrap Supremes and then like a Double-Decker Taco Supreme. Same kind of concept. ZL: If I could relive the first time I ever got to walk onto a movie studio lot, to be able to connect back to that. And I still feel that, if I look around at Warner Bros. or wherever, like “I get to do this?” Ever since I was this big, I’ve wanted to do this, and it’s never lost on me how few people get that opportunity, and even those who have the opportunity, to have the longevity in that and so just to always maintain that awe of how special that is. You walk on, get a pass. I wasn’t Steven Spielberg sneaking in, starting to make Jaws. That time of life felt very magical, because I could tangibly feel my dreams coming true. ZL: Well, Deadpool was, but then Deadpool stopped being a villain, and now he’s more like an anti-hero? So, I wanna say Deadpool. I don’t know, I’ve never really liked villains. I’ve always been like a white hat, through and through. Venom was also a villain I like that then became an anti-hero. AVC: I think you can stick to Deadpool in the comics. ZL: When I first found him in the beginning, like nearer his origins, he was funny but he wasn’t what he ended up to be. They really ended up running with that character and doing all kinds of crazy stuff, which lends itself well to Ryan [Reynolds] and the movies and all that. But at the beginning, there was some funny but I liked him more because he was just badass. I was a G.I. Joe kid, and he looked like a ninja. He looked like Snake Eyes, but with cool red patches, he had double katanas and machine guns, and he could teleport! Hands down, done. AVC: So you were a big comics kid? AVC: So you’re really living the dream right now. ZL: On many, many levels. ZL: I don’t know, there’s so many. I quote movies all the time. I was gonna say, “Oh boy,” that’s from Quantum Leap, so I guess I could say that. AVC: Do people get that when you say that? ZL: Sometimes. That’s kind of a deeper cut. But that’s also one of the great litmus tests. When you throw out a deep cut and somebody’s like [snaps fingers]—it’s like we are totally on the same page, and we’ll be best friends forever. AVC: See, that’s a deep cut from Princess Bride. Thought you were going to go with “Inconceivable!” or something. ZL: Or “Life is pain, highness.” I just used that the other day! ZL: I mean, based on social media and the amount of people who think we look the same, I would say John Krasinski. But we’re the same age, so if you needed like the younger version of me… [Shazam! stars] Asher Angel? Jack Dylan Grazer? I dunno. I’d like to say Tom Cruise. I’d like to say Brad Pitt, but I just think those guys are gonna be real busy. AVC: Maybe you and Krasinski can switch. You’ll do his bio, he’ll do yours. ZL: That would be amazing! Then I’d finally get to be on The Office. ZL: Groundhog Day. It’s my favorite film, I will watch it every single time, doesn’t matter at what point. Beginning to end, it’s so good. AVC: So in effect, reliving Groundhog Day by rewatching it over and over. ZL: Yes, super-meta, 100 percent. AVC: We’re actually not too far away from where it was filmed right now. AVC: Not even in Pennsylvania, just this really cute little town called Woodstock, Illinois. AVC: I think they actually have a plaque where Ned Ryerson steps into the puddle in the town square. ZL: I don’t know. I don’t think I have one. AVC: Concert T-shirt? Stuffed animal? High school jacket? AVC: You’re Marie Kondo, just throwing it all away? ZL: I think we accumulate so much crap, and then we end up being owned by what we own, and I really don’t want that. So I’ve tried just to have no attachment. Because I also think we’re just stewards of what we have anyway. We don’t really own it, it’s passing through us. And hopefully we’re doing a good job of being a steward of it. But I don’t know. I just recently got my first Funko Pop, me as Shazam, so that might be a little prize possession. ZL: Ahh, I make a mean mac and cheese. AVC: That would be so handy in the apocalypse. ZL: I have often said that actors, perhaps artists in general, would be the first to go in the zombie apocalypse. We’re not the blue-collar, we’re not chopping up the wood and stuff. We can make people laugh while they’re chopping up the wood, but eventually that gets old. And then you’re gonna run out of deer to hunt, so, eventually, it’s gonna be the Donner party. AVC: None of you even have any fat on you for the Donner party. What’s the secret to your mac and cheese? ZL: You gotta eyeball it. I don’t know what the exact measurements are, but the secret is always the perfect amount of the powder cheese, the right type of milk (the fattier milk the better), the right amount of butter, the right amount of salt and other seasonings, just a little salt and pepper. AVC: So the mac and cheese you make is from the box? ZL: Oh yeah. You can’t make a better mac and-cheese than Kraft Mac And Cheese, c’mon. You know, honestly? Joshua Gomez, who played Morgan Grimes, my best friend on Chuck. That kid—I say kid as a term of endearment, he’s older than I am—he’s so talented, and I just don’t think he got the look that he deserved. ZL: It’d be kind of a trip to be a Beatle. And I’d have a 50% chance of being alive right now, so that’s not too bad. AVC: Not much touring, though. If you want the hot tubs on airplanes and stuff, they were only together for 10 years. ZL: I wouldn’t be crime-ing. I wouldn’t be doing it. AVC: You really are a white hat. ZL: I really do believe in goodness, even in a fictitious environment—I know it’s fictitious, I get it. I know video games—Grand Theft Auto, you can be the bad guy. I just don’t like being the bad guy, even in a virtual world. I’d be hunkered down, protecting my family and friends. ZL: I think it’s gotta be Indiana Jones. I mean, I’ll take any of them, but Raiders or Last Crusade are kind of equally great to me. Temple Of Doom, also great. But I think we all just need to see Indiana Jones killing Nazis. That’s what was so great about those two. You just want to see him foiling the Third Reich. Oh, oh, oh, oh, or… The Rocketeer. AVC: You definitely have a brand. AVC: Now you’re more familiar with all that stunt work after Shazam!, right? ZL: Not really! When I was on Chuck, I did a lot of stunts. And when I was in Thor, I had horseback riding and sword fighting and all kinds of stuff. For this, I had a lot of harness work for the flying and stuff, but with the fighting, not as much. AVC: It looked really painful for you sometimes, but that was probably just the excellent acting. ZL: Oh, those harnesses are not comfortable at all.